A conservation tillage implement for 10" or 12" vineyard or orchard rows, which tills the outer areas near the plant berms but leaves the center area untilled. Designed for disking terraces or on hillsides, the NVT features hydraulic gang angle settings from the tractor seat, for non-stop adjustments. 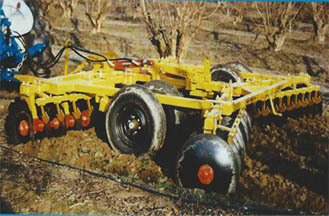 This wheel-controlled tandem disk is ideal for orchard, vineyard or open field disking. The heavy-duty version of the Model JJ, all gang and depth adjustments are the same as the JJ. A vineyard wheel-controlled tandem disk with rugged tubular constructed frame, designed and engineered to withstand the normal rigors of the average vineyard. A heavier version of the VTL with larger frame tubing and heavier gang components. A medium duty wheel-controlled tandem disk with easy crank adjustment for rear gangs, relocating pins to adjust front gangs, and front mounted turnbuckle to level the machine. A heavier version of the OTL with each size being approximately 1600 lbs. heavier. For tractors of 60 to 110 pto horsepower.